Certain documents such as company writing papers are normally based on adjusted Page Setups so as to be able to print them on a certain type of paper. You can apply these settings to other documents as well. 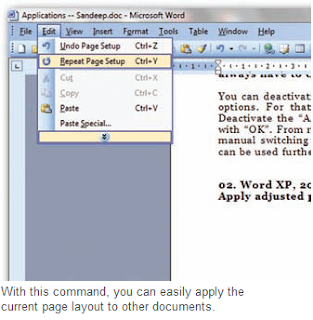 A simple trick can be used to apply the page layout quickly and without programming. Open the document with the correct page layout and the document to be adjusted. Then use the ‘File | Page setup’ command in the finished document. Do not make any changes and confirm the settings dialog box with ‘OK’ instead of ‘Cancel’. Now switch to the next document. In the ‘Edit’ menu, you will now find the ‘Repeat New Blank Document’ command using which you can configure all the settings. If the command after Repeat is different, then you probably did not confirm the dialog box with ‘OK’ or performed another action in the meantime.